With the first launch of Orbital Sciences Corporation’s Antares rocket set for about a month from now, I thought this would be a good opportunity to take a closer look about both the launch vehicle and the Cygnus freighter that will carry cargo to the International Space Station later this year. The medium-lift Antares rocket is an international collaboration. Orbital is the prime integrator and has overall responsibility for systems engineering, avionics, primary structure, testing and software. It also has responsibility for the first stage development and integration. KB Yuzhnoye and PO Yuzhmash of Ukraine are providing the first stage propellant tanks and associated pressurization system. The technology is based on Zenit launch vehicle. The first stage includes two Aerojet AJ-26 engines, which are updated NK-33 motors manufactured by the Kuznetsov Design Bureau for the Soviet Union’s manned lunar program. 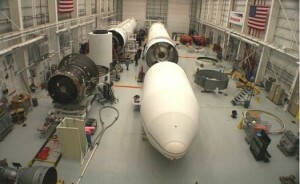 The second stage incorporates Castor solid stage motors produced by ATK in the United States. Ruag of Switzerland is providing the payload separation system. The rocket is designed to lift more than 5,000 kg. into low Earth orbit. The first Antares launches will be from Wallops Island in Virginia, but the rocket is also compatible with launch facilities at Cape Canaveral in Florida, Vandenberg Air Force Base in California, and Kodiak Launch Complex in Alaska. 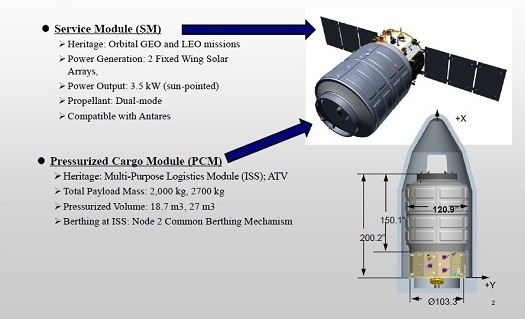 The Cygnus spacecraft is composed of two elements with spaceflight heritage. The Service Module incorporates avionics systems from Orbital’s LEOStar and GEOStar satellite product lines as well as propulsion and power systems from the company’s GEOStar communications satellites. The Pressurized Cargo Module (PCM) is being produced by Thales Alenia Space in Torino, Italy. The PCM is based upon Thale’s Multi-Purpose Logistics Modules, which space shuttles carried to the International Space Station (ISS) filled with supplies. One of the MPLMs was refitted and permanently docked to ISS. Other non-U.S. suppliers include Mitsubishi Electric Corporation (MELCO) of Tokyo for the Proximity Location System and Dutch Space of the Netherlands for its solar arrays. Draper laboratory, Odyssey Space Research, JAMSS America, and Vivace are also partners on the Cygnus vehicle. 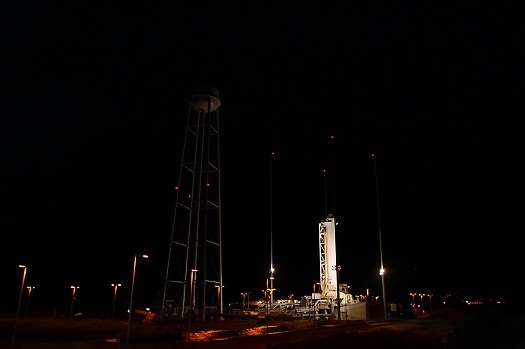 Orbital will fly the inaugural Antares mission without a Cygnus freighter. If that goes well, the flight will be followed by a Cygnus demonstration mission carry some token cargo that to ISS. Both of those flights will be under the NASA-funded Commercial Orbital Transportation Services (COTS) program. Once those two flights are successfully completed, Orbital will begin a series of eight cargo runs to the station under the space agency’s Commercial Resupply Services (CRS) program. NASA will pay about $1.9 billion for the flights. The initial deliveries will feature a standard cargo module with an interior volume of 18.9 cubic meters that will be capable of delivering 2,000 kg of cargo to ISS. Missions four through eight will feature an enhanced cargo module with a volume of 27 cubic meters and improved solar panels that will deliver up to 2,700 kg to the orbiting facility. In all, Orbital is contracted to deliver 20,000 kg to the station. How does ITAR come into play for all these international partnerships? What is the upgrade path for Cygnus, what do they want to do with it in the future? Does it have any reserve fuel in the event of a missed approach? Sweden and Switzerland are not one and the same country (re Ruag). Get your facts right – this is a specialist site after all, and not a tabloid. Fixed it. Thanks. Meant to write Switzerland and wrote Sweden instead. Brain freeze. It happens. Fixed it. Thanks for the correction. Meant to write Switzerland and wrote Sweden instead. Brain freeze. It happens. Everybody makes mistakes. Tabloid? Where the frak does that come from. To comply with ITAR the company must obtain export licenses and TAAs (Technical Assistance Agreements) from the State Department. A license is needed for every foreign supplier. Normally these licenses will have a number of restrictions/provisos. For instance, even with a license in place, the U.S. company usually is restricted from providing the foreing company any information that be used to “improve” their product. In other words, you can’t say “you know Dutch Aerospace, if you just changed your analysis methodology to XYZ, you could save 10% mass”. The separation system is made by RUAG Sweden AB. The headquarter of RUAG is in Switzerland, but RUAG has several divisions in Austria, Sweden and Switzerland.